The Bellevue University Library has revamped the Kindle lending program. The library’s collection of devices now includes two Fire 7 tablets and one Kindle Paperwhite ereader. These new devices replace the outdated 5th generation Kindle e-readers the library had been lending. 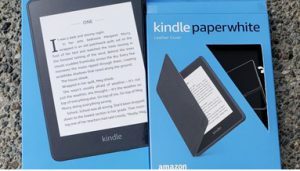 When the library first launched its Kindle lending service in April of 2013, the devices were popular enough to be checked out several times a month. Each e-reader was loaded with a huge selection of Kindle ebooks, from public domain classics to the latest popular titles. Over the proceeding five years, however, customer interest slowly waned. The library staff decided to refresh the service by introducing tablets. The two new Kindle Fire 7 tablets allow users to not only read preloaded ebooks, but also use a variety of popular apps. If you are looking to play games, use social media, stream videos and music, or just browse the web, check out a Fire 7 tablet. The tablets check out for 14 days and can be renewed once. For more details on our Fire tablets’ content, specifications, and availability, view our online catalog. new Kindle Paperwhite. This dedicated e-reader has a long battery life, crisp black-andwhite display, touch screen, and built-in light for reading in the dark. The Paperwhite checks out for 21 days and can be renewed once. See the complete list of e-books currently available on the Paperwhite in our online catalog. Of course, the library’s devices are only as fresh as their content. To keep our collection of Fire 7 apps and Kindle e-books exciting and relevant, we want to hear from our library customers about what we should add to the new devices. 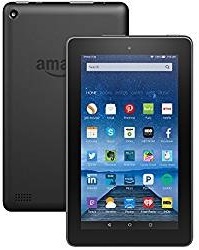 Please submit your suggestions for Kindle ebooks and apps to our comments form: http://library.bellevue.edu/about/comments/. If interested, you learn can more about our Tablet and E-reader Procedures on the library website.